#10 Death Adder's Axe - A foe of supernatural power and strength, it's quite ironic that his very own weapon is the source of his demise, and also rather aptly the title of the game. 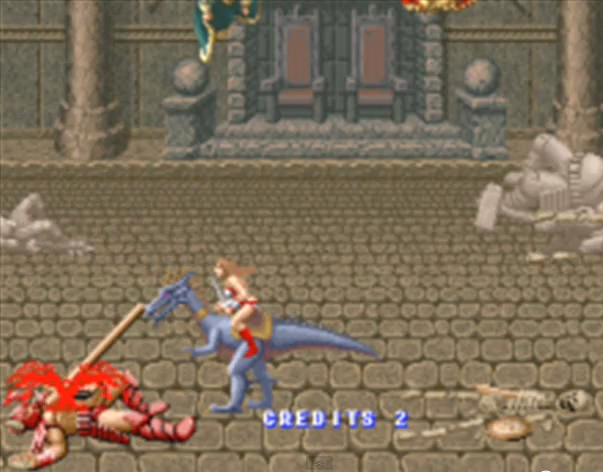 After you enter the throne room, you watch this giant adversary take form from the guts and dead bodies on the floor, the battle ends with you felling him only for his golden axe to spin up and embed itself in his chest. The scream and a fountain of blood are the result that signifies you have beaten the game. An impressive ending to an impressive game. #9 Arwing Crash Sequence - Ok, this maybe not sound that gratuitous, sad or memorable, but it does present itself with a certain theatrical aplomb. After Fox gets one to many hits, your spacecraft takes a dramatic spin and dive into oblivion, accompanied by some teasing music, and ending in a spectacular explosion that underlines the fact that you have failed. Very Star Wars inspired, and all the better for it. Of course, I always blame that damn frog! #8 Barbarian's Lost Head - This happens so quickly that you almost think it didn't happen, and you instantly curse your poor game skills as a result. In both the Barbarian titles, your titular caveman is happily fighting his way through the dungeons and then all of a sodden up pops a Saurian Beast or a Ogre and brazenly whips off your head in one mouthful or swipe. The tiny spurt of blood confirms the worst, and it's time to start over.The beast also has the audacity to swallow it and laugh at your torso. Cheek! #7 Ninja Gaiden's Continue - This cool martial arts beat 'em up doesn't come across as especially violent, or shocking for that matter. There you are, beating up the thugs, jumping off the lamposts and generally being the hero type, what's the worst that could happen? 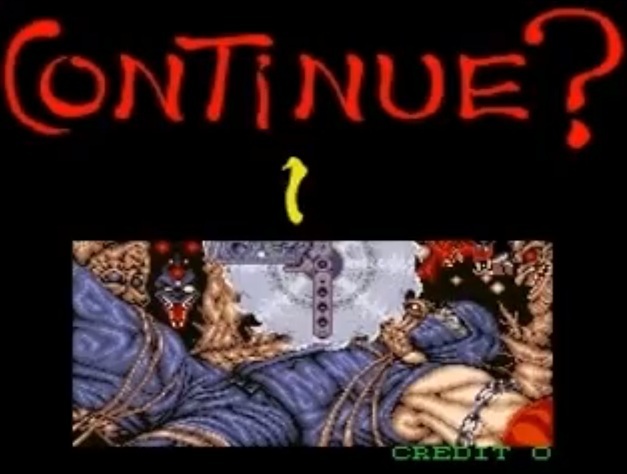 Only when you are defeated and it's game over, you are presented with the continue screen, and suddenly your stealthy champion is bounded by evil creatures whilst a serrated chop-saw gets slowly lowered down onto your helpless body. Only by putting in an extra credit will stop the inevitable; a messily carved up dead ninja. What a waste of a decent Shozoku, Ariel Liqui-tabs won't get that stain out! #6 Pacman Gets Caught - Not the most eye-catching, not the most emotional and certainly not the most realistic; the sights and sounds of Pacman folding in on himself to meet his end is an image that has been used many times over in various media, and its also one of the most recognisable. I mean, it's a yellow circle that disappears slowly with a unforgettable sound effect that means death has come. Basic, but what an impact it has had on the culture that grew up around it. #5 Raziel's Fall - It's not exactly a death to be true, more of a re-birth, demonstrating the experience of terrible pain suffered during a violent death that makes this stand out. Being the protagonist from the Soul Reaver games, Raziel's untimely dip into The Lake of the Dead is a engrossing and torrid sight. As he burns away in the waters, the solemn narrative makes you feel the torment of his plight, thus urging you to avenge the torture. An excellent scene, dramatic and sets up his story with gusto. 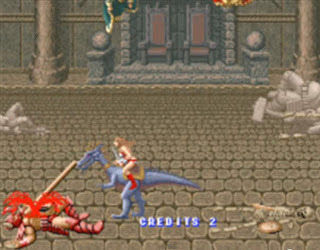 #4 Authur's Skin & Bones - With a amusing twist, the hero from the Ghosts 'n Goblins series of games gets two bites of the cherry when he gets hit by a zombie or ghoul. Firstly, he loses his armor and fights on regardless in is underpants for comedic effect, but a second hit reduces him to a pile of flesh stripped bones. To add a touch of dark humour, his skull gapes open right at the end of this sequence. Nice. #3 Sub-Zero's Fatality - This is honestly and certainly solely responsible for the formation of the ESRB, the video game censorship people. It was a striking moment for arcade frequenters when the ice-loving ninja performs his fatality move; graphically ripping the head of his opponent, spinal cord intact, and holds it up aloft in morbid triumph. Mortal Kombat, the game it originates from was full of these finishing moves, but none quite so gruesome as this. Well, maybe Kane's. It bears plenty of significance with the restrictions of future violent content in video games hereafter. Gory and memorable. #2 Eden's Release - For a morose and poignant computer death, or in this case non-death, most people choose GlaDOS from Portal. I however choose Eden from the magnificent Rez. Throughout the entire game, Eden has been trying to halt her own salvation at your hands, wanting to shut-down forever under the influence of the confusing and contradicting information she has received about life, thus wanting not to be a part of it. But when you finally get a chance to re-boot her tortured soul and save the world, she literally begs to be put out of existence. With a heavy heart, you cannot do this for the sake of all living things. Thought-provoking stuff. 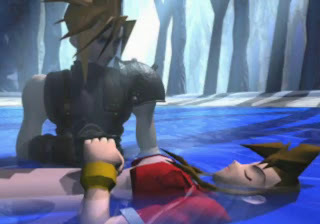 #1 Aerith Gainsborough's Farewell - This came as a shock to all that have played one of the finest games ever, mostly because of it's brutality and suddenness. The innocent and sweet flower girl from whom you have learnt so much, puts herself at the front of harms way, and pays the price with her life. When Sephiroth swoops down and his sword pierces her, you say to yourself "No!" This iconic scene is compounded by the evil sneer of your foe as he exits, the beautiful heart-rending music being played and the image of a mournful Cloud slowly lowering her body into the waters of the Ancients. Powerful, emotional and another highlight of what makes Final Fantasy VII such an awesome game. On that rather sorrowful note, that's the end of my top 10 of gaming deaths. I can already hear the shouts of what has not been included, and I'm sure your personal list would be different. Dead Space maybe? Silent Hill? Please suggest your most significant moments. Deaths in video games can have an effect on us more than say a movie or TV show, as we, in a sense, are living the lives of the people affected by these passing's. Also, its always a source of entertainment and interest. Going into day 11 of my personal top 10's, we look at our hero's, our top bods, our L-egends of video gaming! Have to agree, that encounter with Eden at the end of Rez is emotionally wrenching. And you gotta love Sub-Zero's finisher, the definition of FATALITY! Those are all great choices. Even though I stopped playing video games long ago, I used to watch my brother play after that. Some of those deaths are really surprising, or simply memorable.